In the tradition of Lost In Translation and The Squid and the Whale, Paper Man is a wonderfully quirky drama about people trying desperately to find the same joy in real life as they do in their imagination. Golden Globe and Tony nominee Jeff Daniels stars as Richard Dunn, a no-hit wonder of a novelist squirreled away in Long Island by his sensible, surgeon wife (Emmy Winner Lisa Kudrow) to get cracking on his next novel. Richard isn't totally alone: along for the ride is a local teen (Emma Stone) who befriends Richard after he hires her to be a babysitter ... his babysitter. Plus, there's Richard's imaginary best friend from childhood, Captain Excellent (Ryan Reynolds), a confidante always ready to prod him along towards adulthood, whether Richard wants it or not. Aching, funny and true, Paper Man is a genuinely offbeat gem that marks the promising debut of writing and directing team Kieran and Michele Mulroney. $8.613 thousand on 3 screens. 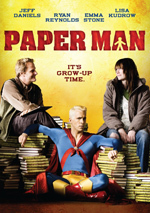 For a quirky character piece, we head to 2010’s Paper Man. Richard and Claire Dunn (Jeff Daniels and Lisa Kudrow) move to Long Island in her attempt to get her middle-aged husband to finally grow up. She’s a successful surgeon who brings home the bacon, while he’s still searching for his purpose in life. He writes novels but hasn’t been able to make a mark in that field. Tired of his aimlessness, Claire plops him in Long Island to get him to focus on the completion of another novel; she remains in Manhattan during the week. He finds it hard to focus and feels haunted by Captain Excellent (Ryan Reynolds), his lifelong superhero imaginary friend. To help him concentrate, he hires local teen Abby (Emma Stone) as a babysitter, even though he has no kids. They develop a friendship as Richard tries to write his novel. At its start, Paper works pretty well. In Daniels’ hands, Richard becomes an engaging character. He could’ve easily been little more than an annoying conglomeration of quirks, but Daniels makes him fresh and interesting. As we see Richard struggle with his book and develop his unusual relationship with Abby, the movie does fine for itself. Oh, I could do with less of Abby’s teen angst and her predictable dickwad boyfriend, but the movie comes along at a good pace and develops the personalities in a satisfying way. And then, it just kind of hits a wall. Maybe saying it “hits a wall” isn’t accurate; it implies I can pick a moment at which the film clearly derails, and I can’t. However, I do feel like the movie’s quality takes a definite dip at some point, and it never manages to recover. What goes amiss? Paper loses its silliness and tries too hard to become a Deep ‘n’ Meaningful drama. In that regard, it doesn’t succeed. A movie about a 50-something man who still chats with his imaginary friend probably needs a continued sense of whimsy. It’s a bit of a miracle that the film pulls off those whimsical scenes as well as it does – I usually hate that kind of stuff – so their absence means I find myself less engaged in the process. Some predictable character revelations don’t help. I get the sense the filmmakers feel that without heaviness, Paper will be less powerful. I disagree and believe that it could’ve worked better without so many forced attempts to generate high drama. Sure, character evolution is great, but I don’t feel the participants all needed such big changes to occur. This means too much melodrama and too many heavy-handed metaphors as the movie progresses. And that ultimately makes the end product less than satisfying. At no point does it threaten to become a bad movie, but Paper Man fails to demonstrate the natural heft to allow it to prosper. Though it has its moments, it falters too much along the way. Paper Man appears in an aspect ratio of approximately 1.85:1 on this single-sided, double-layered DVD; the image has been enhanced for 16X9 televisions. This was an acceptable transfer. For the most part, sharpness appeared adequate to good. Wide shots tended to look somewhat soft and ill-defined, but the majority of the movie came across as reasonably concise. No jagged edges or moiré effects, but a little edge enhancement popped up and I noticed light digital noise at times. In terms of source defects, I witnessed a handful of specks and marks, but nothing substantial materialized. The film went with a subdued palette that looked fine. Colors never exactly popped off the screen, and they sometimes seemed a little runny, but overall, they were reasonably accurate. Blacks appeared dark and dense, while shadows tended to be a bit thick. This was an adequate SD presentation. As for the film’s Dolby Digital 5.1 soundtrack, it remained pretty low-key. General ambience ruled the day, as little more exciting than that appeared. Some seaside shots offered decent breadth, and music spread well to the back speakers. Nonetheless, nothing especially lively popped up here. Audio quality seemed fine. Speech appeared natural and concise, as the lines always remained intelligible. Music seemed full and rich, while effects showed good accuracy. Nothing here stood out as particularly memorable, but the track was fine for a film of this sort. In terms of extras, the main feature comes from a Making Of featurette. This lasts 12 minutes, 42 seconds and includes notes from writers/directors Kieran Mulroney, Art Spigel and Michele Mulroney, producers Ara Katz and Richard N. Gladstein, and actors Ryan Reynolds, Jeff Daniels, Lisa Kudrow, Emma Stone, Kieran Culkin and Hunter Parrish. The piece looks at characters and story, the film’s roots and development, cast and performances, sets and locations, and the work of the Mulroneys as directors. Some of the standard fluff emerges here, but we get enough details to make this a decent featurette. The disc opens with ads for The Baader-Meinhof Complex, Made for Each Other, Joan Rivers: A Piece of Work and The Last Lovecraft. We also get the trailer for Paper Man. After an engaging start, Paper Man falters. It still manages to keep us reasonably invested in it, but it lacks the natural movement to make it wholly satisfying. The DVD provides average picture and audio along with minor supplements. Though it has some positives, the movie ends up as too inconsistent to really succeed.